Ok, I’m just getting started with this whole keeping-track-of-my-life-on-the-internet thing, and already everyone reading this is going to think I’m a total shopaholic. But really, the last entry was about ERRANDS, so that doesn’t count, right? 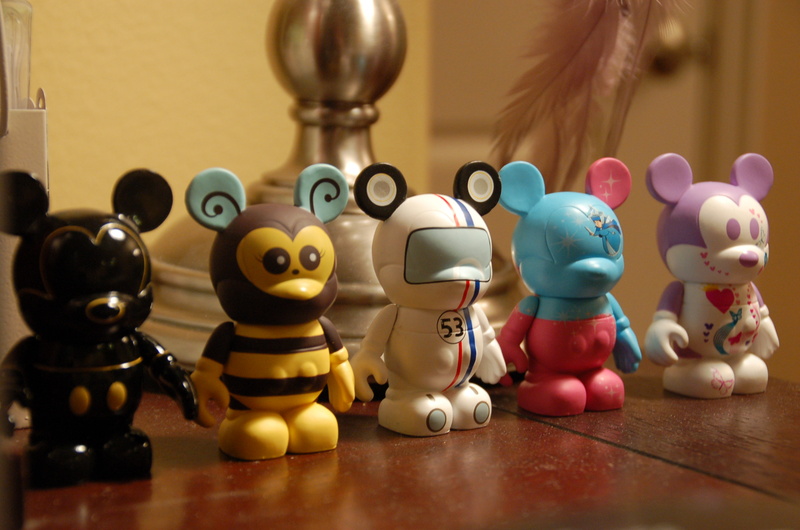 It is days like those (cough today cough) where sometimes, something small – a cool pen (I’m a dork), a vinyl toy (Disney’s Vinylmation, pictured above, has SERIOUSLY grown on me for some bizarre reason. I’m such a sucker. And did I mention major dork?) or that DVD you’ve been wanting (it took some serious self control not to go to Target straight after work and pick up Ponyo, which just came out) takes you’re mind off the crazy and helps you unwind. Granted if that little destressing shopping trip turns into 5 DVDs and a couple of cute skirts AND omg I couldn’t resist those Jimmy Choos…well maybe then it’s time to find a new way to relax. But seriously. I had to ACT today, among other things. And it was awkward. And I’m REALLY surprised I didn’t end up at Target. Look who has some willpower now! ha.